My most recent Weber video is a favorite for two reasons. One, it's prime rib. Two, it's on the rotisserie. If you own a kettle, the rotisserie is the one accessory you absolutely need. Its magical spinning power transforms any cut of meat into something more. Yes, sometimes I think to myself, do I really want to clean the spit and forks? Thankfully, I'm good at talking myself into things, because the answer is almost always, yes. This Jamie Purviance recipe is yet another reminder of why the rotisserie is my favorite tool in my grilling arsenal. 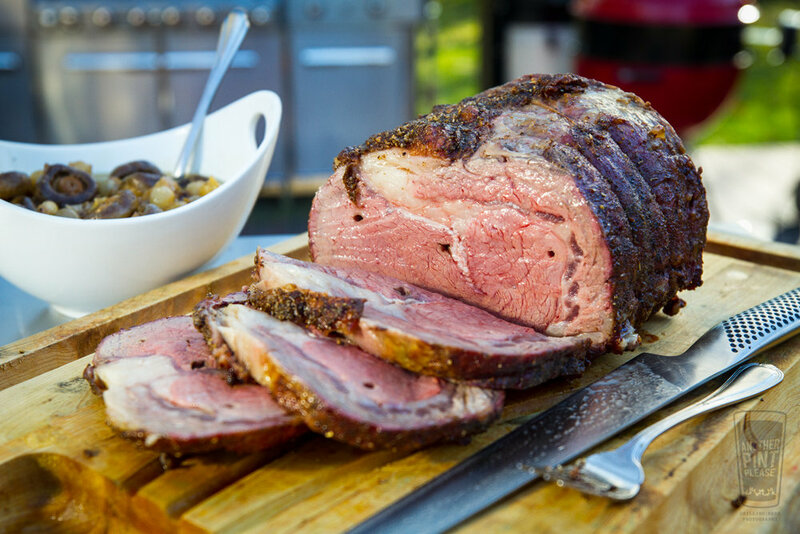 The rotating meat is gently heated, continuously self-basted, and packed with flavor. It's also easy. Not surprisingly, the sauce is more involved than the roast. The internal cooking temperature of the meat is paramount to success. Unlike dropping a roast on the grates and using a remote probe thermometer, like the iGrill, the spinning pit means periodically stopping the rotation to check the temperature. This means making sure you use time to get in the ballpark of the finished temp. It takes a little bit more "care," but it's worth the effort. When shooting video, the leisure cook time also makes for a leisurely shoot. Add in some unseasonably warm weather and the wafting smell of grilled beef and it was the makings of a perfect day! Just remember, if you are going to go decadent, ready the spit! Note: My Weber work is compensated and the rotisserie link runs through my Amazon affiliate account. Thanks!